Last major update issued on March 9, 2004 at 04:40 UTC. The geomagnetic field was quiet to unsettled on March 8. Solar wind speed ranged between 327 and 383 km/sec. Solar flux measured at 20h UTC on 2.8 GHz was 107.8. The planetary A index was 6 (STAR Ap - based on the mean of three hour interval ap indices: 7.3). Three hour interval K indices: 11222321 (planetary), 11313321 (Boulder). At midnight there were 4 spotted regions on the visible disk. Solar flare activity was low. Only 1 C class event was recorded during the day. Region 10569 was quiet and stable. Region 10570 was mostly unchanged with polarity intermixing observed at several locations both in the leading and trailing spot sections. A minor M class flare is possible. [S368] This region emerged on March 8 in the southwest quadrant. Location at midnight: S04W64. 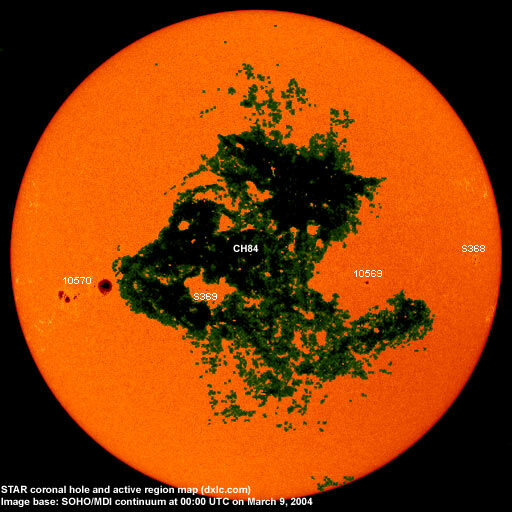 [S369] A new region emerged on a coronal island inside coronal hole CH84 on March 8. Location at midnight: S15E13. March 6-8: No partly or fully earth directed CMEs observed. 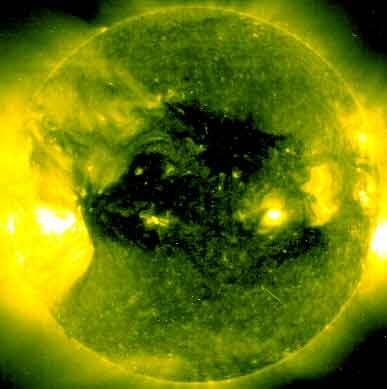 A large recurrent trans equatorial coronal hole (CH84) will be in a geoeffective position on March 7-11. 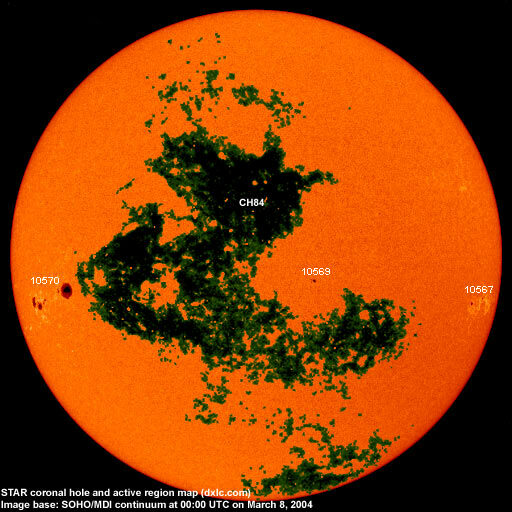 CH84 developed on March 7-8, particularly in the southeastern and central parts. An extension of CH84, or possibly a new coronal hole, developed in the southwest quadrant. Processed SOHO/EIT 284 image at 01:06 UTC on March 9. The darkest areas on the solar disk are likely coronal holes. The geomagnetic field is expected to be quiet to minor storm on March 9 and unsettled to major storm on March 10-14 due to a high speed stream from coronal hole CH84. Long distance low and medium frequency (below 2 MHz) propagation along east-west paths over high and upper middle latitudes is poor (propagation was fair to good at 02h UTC but deteriorated quickly). Propagation along long distance north-south paths is poor. [Trans Atlantic propagation conditions are currently monitored every night on 1470 kHz. Dominant stations tonight: Radio Vibración (Venezuela). Quite a few east coast North American stations were noted at 02h UTC, most of those stations were not audible two hours later].